Here's Your Chance to Attend… and Grow Your Note Business to New Heights! If you've made it to this page, it means you've read one of my reports or attended a webinar on investing in real estate backed notes and showed me your interest in this largely untapped industry. It's the business I love. And you're going to love it too. 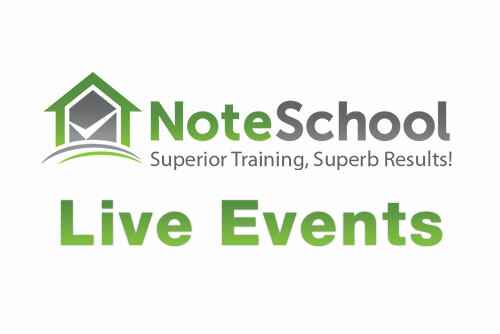 If you're looking to dive-deep and get your note business off the ground quickly, then the next step is to attend a 3-day live NoteSchool class! You'll learn about performing notes and non-performing notes… the pros and cons of each, and which is better for your personal situation. How to sell a turnkey rental property PLUS owner financing, for a whole lot more profit. How to use money from your IRA to get your first note under your belt. You won’t have to give any of your profits to Uncle Sam...and it’s perfectly legal. How to have multiple exit strategies which allow for huge creativity to bring big profit upfront AND big cash-flow on the back-end. P.S. – I firmly believe there is no better way to invest your hard-earned money than in real estate backed notes. Heck, if you're willing to do a little leg-work, you don't even have to use your own money… I have students who do it both ways. Come to the next NoteSchool class and decide for yourself. Learn more about my all new 50/50 model. You're going to love it!